Bangladesh Bureau of Statistics bbs Exam Notice 2017 has been published by the authority. 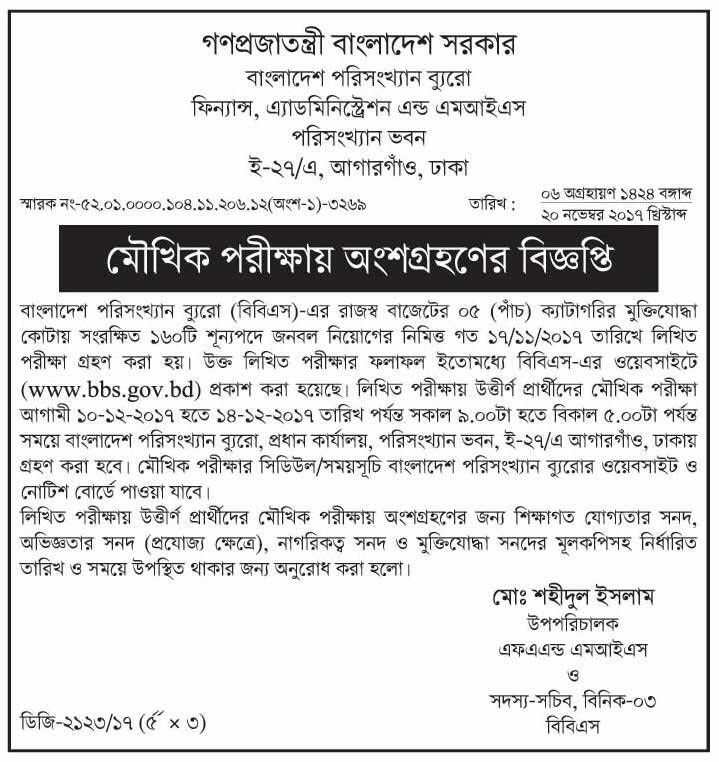 It’s the most important notice for These people who applied in bbs.gov.bd. Bangladesh Bureau of Statistics Exam date 2017 has been announced. It’s the most important and valuable exam for these candidate Who want to get jobs in Bangladesh Bureau of Statistics. Bangladesh has a centralized official statistical system named Bangladesh Bureau of Statistics (BBS). After independence in December 1971, Bangladesh owned a weak, disintegrated and disorganized official statistical system. There were many agencies engaged in statistical data generation, dissemination but they were working independently of each other having little co-ordination among them often resulting in duplication, inadequacy. Data generated by them were inadequate and in many areas incomplete and as such, could not provide satisfactory basis for formulation of plans and policies for the new nation. Consequently, need for an integrated national official statistical system, was urgently felt. The then Government realizing the pressing need undertook some initiative to streamline the data collection system in this new born country. Accordingly in August 1974, the Bangladesh Bureau of Statistics (BBS) was created by the Father of the Nation Bangabandhu Sheikh Mujibur Rahman by merging four relatively larger statistical agencies of the erstwhile provincial and central governments, namely, the Bureau of Statistics, the Bureau of Agriculture Statistics, the Agriculture Census Commission and the Population Census Commission. A Director General was also appointed by the government as head of the BBS and a follow-up plan for reorganizing the bureau into an efficient centralized national institution in the field of official statistics was undertaken. After about a year, in July 1975, the Statistics Division was created under the Ministry of Planning in order to coordinate and monitor, co-operate activities of the bureau at ministry level. The Statistics Division was headed by a Secretary who was also simultaneously the Director General of Bangladesh Bureau of Statistics. In 2002, the Statistics Division was merged with Planning Division of Ministry of Planning and BBS was placed under the administrative control of that division. The Director General who is the chief executive of BBS is an Additional Secretary to the Government. Bangladesh Bureau of Statistics is responsible for providing technical and administrative guidance in matters of all official statistical programmes and acts as the implementing agency of all programmes of official statistics of Bangladesh. Bangladesh Bureau of Statistics (BBS) is only the national Statistical institution responsible for collecting, compiling and disseminating statistical data of all the sectors of the Bangladesh economy to meet and provide the data-needs of the users and other stake holders like national level planners and other agencies of the Government. The role of the BBS in providing necessary statistics for preparing the various national plans and policies for the overall development of the country is very significant. Bangladesh Bureau of Statistics has a decentralized network for implementation of its activities with its head office in Dhaka. At present, there are 8 (Eight) Divisional Statistical Offices, 64 District Statistical Offices located in 8 (Eight) Divisions and 64 Districts and 489 Upazilla/Thana offices in Bangladesh.